· Large logo stitching on upper front; number two appliqué on both arms. 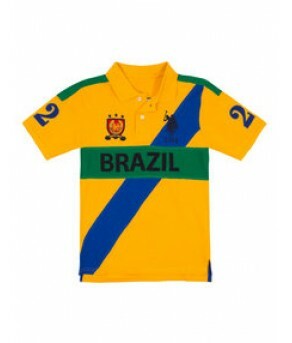 · Large patch on upper right, “BRAZIL” across the chest with diagonal stripe across front. · Brazilian flag appliqué, number two appliqué on back. · Short sleeves with ribbed cuffs. · Vents at hem; back is longer than front. · Classic polo shirt construction.